We’ll get back to the extreme northern fringes of Illinois, including Belvidere, soon, for now we must jaunt southward, along Illinois 47 until we hit Livingston County, a place where we can get our kicks. 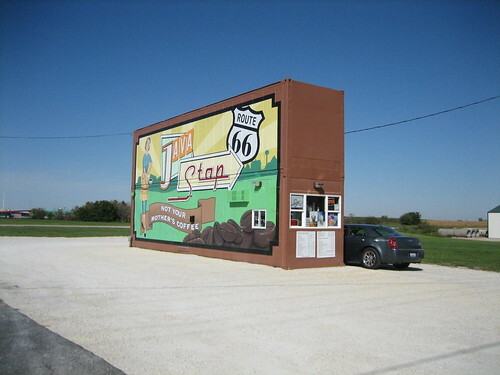 Route 66 through Illinois, St. Louis to Chicago — The Mother Road. I wrote up a bit for Wikipedia on this topic too, but I left it unfinished, you will find the link at the bottom of this page with several other useful resources. The topic of Route 66 likely conjures all sorts of imagery in your mind. But it needn’t remain melded to your brain, no! It can be seen, just a short drive from the stateline area. Livingston County is a great spot to see it, in all its glory. The communities of Dwight and Pontiac are particular gems. Other communites, such as Odell have their qualities too, and the wonders don’t cease at the Livingston-McLean County line. I doubt this can be covered in just one post, there are buildings and roads to discuss. Onward! Follow me on a little journey I took. As you hit the former path of U.S. Route 66 in Livingston County you can’t help but catch a wave of nostalgia, yep, the cheesy kind that pop culture made fashionable. Sure is sweet though, if you go at the right time, surrounded by corn, harvest approaching; you can almost imagine the endless open prairies filling early settlers with the terrifying visions of complete aloneless that Kerry A. Trask was certain existed in his 2007 book on the Black Hawk War. But I digress, the nostalgia we’re looking for isn’t found in Big Blue Stem or Iron Weed. The first town you come to is Dwight, Illinois. And one of the first things you see is this odd coffee stand, constructed from two shipping containers stacked atop each other. It’s understandable though, they’re bankin’ on this Route 66 thing down there, not much else going on. I think it works pretty well. Across from that bizarre coffee stand is a classic house and canopy style gas station, fully restored to its 1940s glory. The house and canopy style is exactly what it sounds like, a building resembling a house with a canopy extending out over the pumps to protect customers during bad weather (which I assure you, is frequent in the region). I constructed a Wikipedia entry about the building, Ambler’s Texaco Gas Station, for you. Ambler’s Texaco is a perfect example of a Route 66 gas station, always photogenic; but the photograph below, I just got plain lucky. The building, located along the actual Old Route 66 street in Dwight, was the focal point of Route 66 enthusiasts on their way to some kind of convention in Springfield, Illinois the day I visited, or so said the old fella runnin’ the shop. Hence the great photo op. Interior and exterior were fully restored to period, but there were a couple things out of place, if you look below, you will see a wrinkle in the otherwise convincing period presentation. 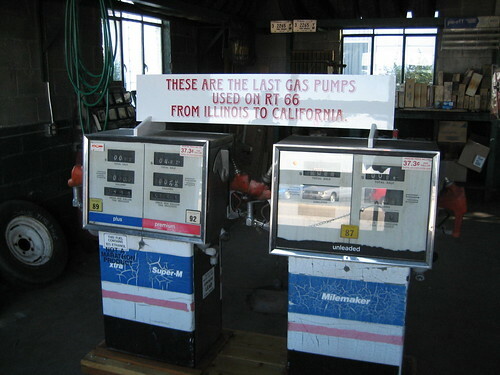 The station boasts the last operating gas pumps along U.S. 66, that’s nationwide. Those pumps are conspicuously concealed inside the station’s service bay, a common feature in house and canopy style stations. 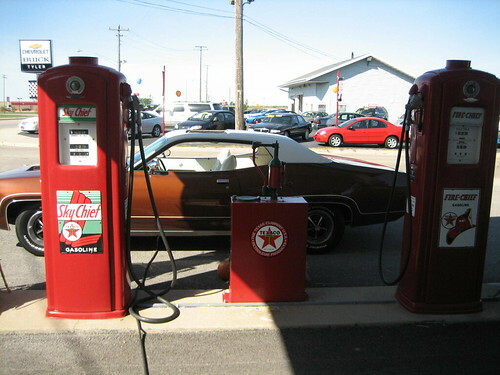 The pumps on display outside are a 1940s style to complete the period restoration. 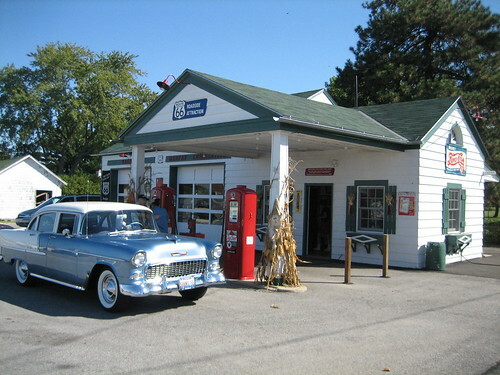 We’ll see more about gas stations when we continue on toward Odell, Illinois, and one of my favorite stops on the Dwight-to-Chenoa, Illinois-Route 66-tour; tomorrow, though, a Frank Lloyd Wright bank. *Historic and Architectural Resources of Route 66 Through Illinois: NRHP Multiple Property Submission Cover: This document is nearly encyclopedic in its coverage, great resource.